It was a gorgeous night for racing at the Dacotah Speedway on July 18th. Cooler than expected weather caused for some last minute track prep but the track couldn't have turned out better as each feature was filled with three and four wide racing. The IMCA Sport Compact feature kicked off the night. Kody Stoxen, who started fourth, quickly grabbed the lead from pole sitter Michelle Stoxen. Points leader Josh Roehrich patiently drove his way to the front, picking off Chance Seelye for fourth, Nic West a lap later and overtaking Brandon Anderson for second. Roehrich quickly reeled in leader Stoxen with five laps to go and followed in Stoxen's tire tracks but couldn't find a way around the leader. Kody Stoxen led all 10 laps to win his first feature of the season over Josh Roehrich. 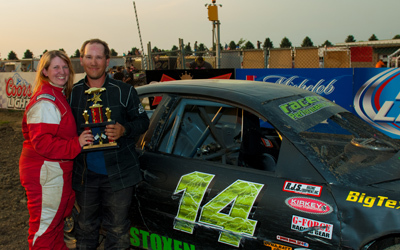 Brandon Anderson finished third ahead of Chance Seelye and pole sitter Michelle Stoxen. 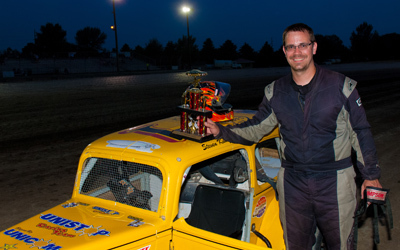 Chad Hausauer powered to the front after starting third in the Hobby Stock feature. Hausauer q uickly pulled away from the field and the race was for second place as Nathan Messer had his hands full trying to hold off a strong Jaren Wald. They raced side by side for several laps until Wald cleared the pass for second on lap seven, opening the door for cousin Wyatt Rath-Wald to follow. A caution with two laps to go erased Hausauer's nine second lead on the 22 car field. On the restart, Rath-Wald passed Wald for second but racing down the backstretch on the final lap, he slipped off the banking and crossed the finish line a disappointing ninth place. Jaren Wald finished a distant second behind feature winner Chad Hausauer, who dominated race and won his first feature of the season. Dickinson's Derek Voller finished third as Keith McCleary made a last lap pass to finish fourth over Brent Vetter. Pole sitter Matt Brendel and John Feist raced side by side for the lead in the WISSOTA Street Stock feature. Feist would win the battle and take the lead from Brendel has he tried to hold off third place Shawn Volk. A lap two caution would reset the field but on the restart, action picked up at the front as it was a four car battle for the lead between Feist, Brendel, Volk and Zach Frederick. Volk and Frederick slipped by Brendel and they raced hard for second. Frederick's high line gave him the momentum by Volk for second and challenge Feist for the lead. Feist and Frederick raced door to door for the lead for several laps until Frederick took the position with seven laps to go. As the top four continued to race side by side for position, it allowed points leader Eric Paul to quickly catch them. Paul passed Shawn Becker for fourth and passed Volk for third a lap later. As the laps wound down, Paul picked off Feist for second and was bumper to bumper with Frederick, battling for the feature win. Eric Paul ran out of time and finished a close second to Zach Frederick who picked up his second feature of the season. 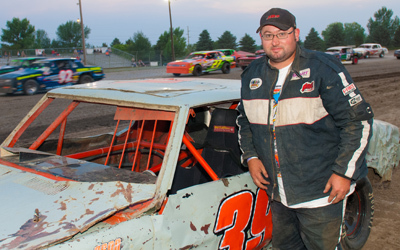 John Feist finished third after leading nine laps while Dustin Frank made a late race charge to finish fourth ahead of Shawn Volk and Shawn Becker. Wishek's Andrew Jochim led the first lap in the INEX Legends feature. Jochim's lead was short lived as Dauntae Martin blew by, bringing Tom Wagner with him on lap two. Martin had company up front as Wagner and Steven Kuntz battled hard for the lead. Kuntz hugged the guardrail and his low line propelled him into the lead before a lap four caution. Kuntz survived a series of short cautions before Shane Williams of Minot took the lead with five laps to go. A late race caution set up a five lap shootout and on the restart, it was a three car battle for the win between Williams, Kuntz and Troy Hoff. Hoff shuffled into the lead with three laps to go but Kuntz rallied back and they raced side by side for the win. Hoff edged Kuntz to take the white flag and they continued to race side by side but coming out of turn four and to the checkered flag, Hoff got loose and Kuntz crossed the Open Road Honda finish line for the third time this season as the feature winner. 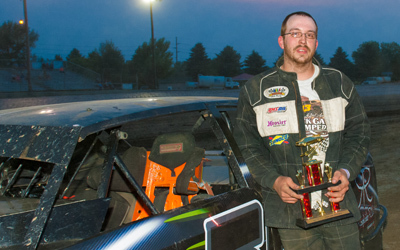 Points leader Donavin Wiest finished second while Shane Williams finished third. Troy Hoff held on to finish fourth ahead of Paul Morman. In the final feature of the evening, Russ John led the field to a complete restart in the IMCA Modi fied feature. On the restart, Tracy Domagala grabbed the lead and quickly pulled away. Russ John fell into the clutches of third place Donald Robinson and fourth place Jeremy Keller. Robinson passed John for second and a lap later, Keller followed. John continued to fade through the field, losing fourth place to Spencer Wilson and fifth place to Jerad Thelen. John rallied back to retake the fifth position when Thelen bobbled in turn four. They continued to battle for fifth place, allowing Mark Dahl who started 26th in the feature, to pass them both with 11 laps to go. A caution with ten laps to go changed everything when Chris Welk spun in turn three and collected leader Tracy Domagala. Jeremy Keller inherited the lead and on the restart Wilson passed Robinson for second and dove low under Keller to take the lead. Robinson had a late race slide, losing positions to Dahl, Drew Christianson, Shaun Strand and Jerad Thelen. A caution with one lap to go froze the field and ended the race. 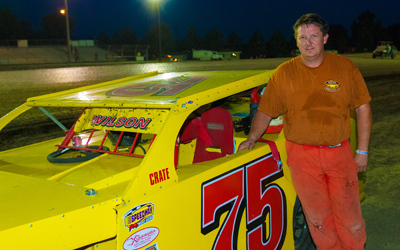 Spence Wilson led the final eight laps to win his first feature of the season. Jeremy Keller held off Mark Dahl for second as Drew Christianson and Shawn Strand round out the top five. North Dakota Governor’s Cup with the WISSOTA Late Model Challenge Series - presented by Budweiser, distributed by McQuade Distributing comes to the high banks of Dacotah Speedway on Friday and Saturday, July 25th and 26th.